David Azoulay resigns from Knesset - but will stay on as Religious Affairs Minister in attempt to push through Supermarket Law. 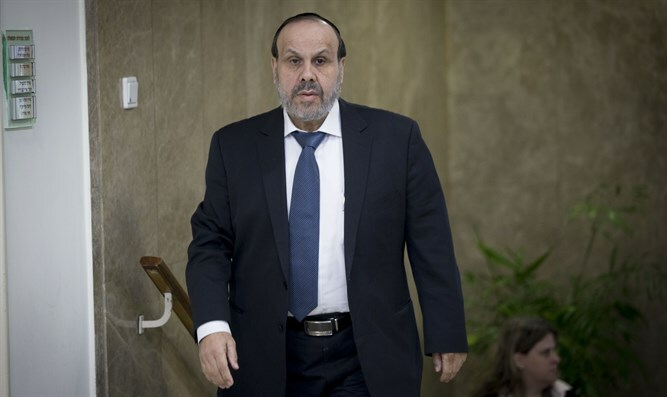 Religious Affairs Minister David Azoulay (Shas) abruptly announced that he will resign from the Knesset on Thursday in an attempt to push through the controversial Supermarket Law. Azoulay will stay as minister and will be succeeded in the Knesset by his son, Yinon Azoulay. Azoulay has been hospitalized due to an undisclosed ailment and has struggled to be present at the Knesset in time for votes. Last month, Azoulay was almost forced to leave his hospital bed and head to the Knesset in order to ensure a law's passage after opposition MKs refused to grant the coalition a pairing, an informal arrangement between government and opposition parties whereby a parliament member agrees or is designated to abstain from voting while a member of the opposing party needs to be absent. Because of his ongoing health issues and the refusal of opposition MKs to grant him a pairing, Azoulay resigned in order to ensure that the passage of the Supermarket Law, which would grant the Interior Minister the powers to block bylaws passed by municipal authorities that allow grocery stores and mini markets to open on Shabbat. As Azoulay's son Yinon is number 16 on the Shas list, the preceding four members must voluntarily waive their right to enter the Knesset. The informal pairing custom was the subject of controversy on Monday after Deri asked a rabbi to examine whether MK Yehuda Glick, who is sitting Shiva following the passing of his wife, would be able to vote in the Knesset on a bill to give his office authority over business openings on Shabbat. Deri was subject to vehement attacks following the expose by observers alleging that the move was callous. As a result, the coalition decided on Monday evening to postpone the vote on the Supermarket Law for one week, after the coalition leaders understood that they would not be able to muster the majority needed to approve the bill.